Thank you for all the birthday wishes. 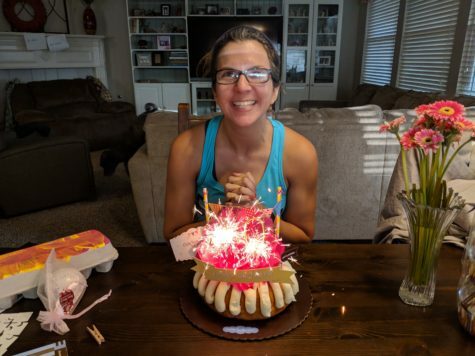 My first day of being 40 was AWESOME! My workout friends had a new shirt for me to wear that morning and cupcakes to share with everyone after we worked out. They also put a Happy Birthday balloon and a 100 balloon on my mat. 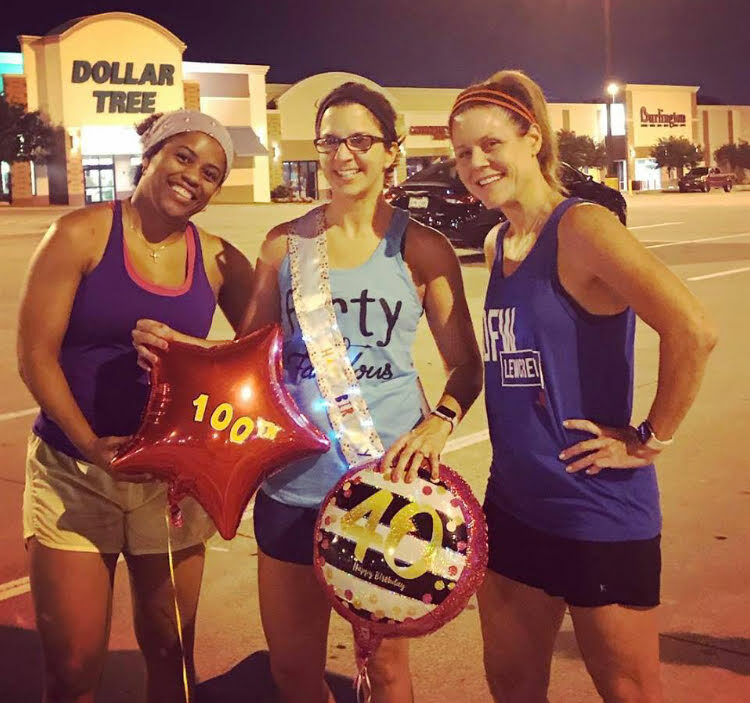 100 because I was on my 100th workout for CG. My coworkers surprised me with lunch, balloons, flowers, and cake. BoyGeeding gave me Blue Bell Cookie Dough ice cream with a Wicket card and DaughterGeeding gave me a bath ball with a sweet card from a memory when she was a baby. She also gave me an empty egg carton, but it wasn’t really empty; she had blown a kiss into each section. The best gift was from my hubby. He’s a pretty creative guy if you didn’t know. A card was stuck in the door which I went through early that morning when I went to work out. It was a glittery Mickey Mouse birthday card with a small black light inside. I immediately started looking for clues in the card and around the laundry room. Once I returned from my workout there was a letter on the door about life being a puzzle. As I walked into the house I noticed strips of paper on the floor with a couple of puzzle pieces. 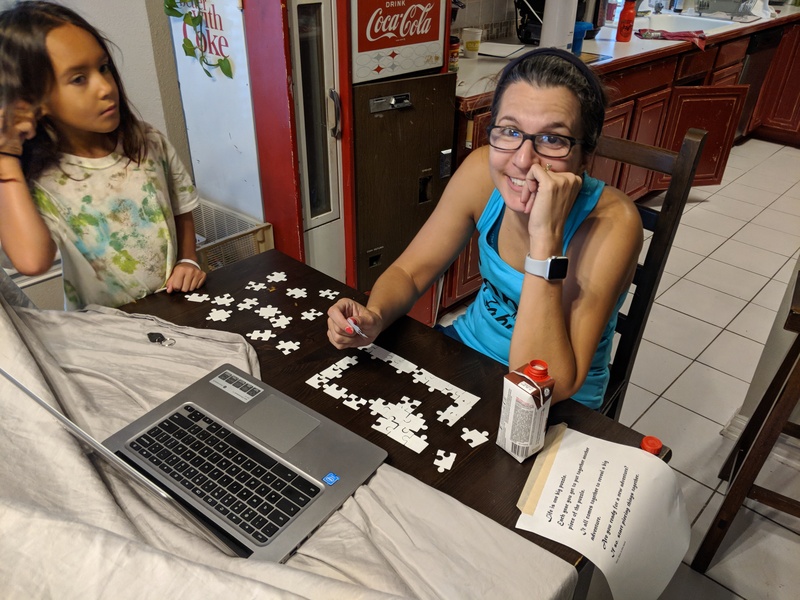 I continued to walk into the living room and was greeted with a “Happy Birthday” from my family and more strips of paper and puzzle pieces. The strips of paper all had facts regarding 40. For example, “Forty is the only English word that is written in alphabetical order”, “During Moses’ life he lived forty years in Egypt and forty years in the desert before God selected him to lead his people out of slavery”, “Minus 40 degrees, or “40 below,” is the only temperature that is the same in both Fahrenheit and Celsius.” Once I collected all the puzzle pieces I tried to put the puzzle together. This was very difficult because all the pieces were white. No picture. Keith eventually pulled up a picture of what it should look like so I could at least look at the shape of the puzzle pieces. It became a group effort to complete it. I thought I would never finish it and would be late for work. Eventually, the puzzle was put together, but was still white. I knew it must be time to use my black light. It revealed a message, but some of the pieces were upside down which made the letters upside down. Keith had to tell me the beginning, “Your journey is not yet complete…”I could make out the words ‘fly’, ‘beach’ and ‘Disney’. I looked up at Keith, who was recording everything, and said, “Are we going to Disneyland?” He said yes and we screamed! Not only was it a surprise to me, but also to our children. We were all ecstatic! We finished the morning celebration with White Chocolate Raspberry Bundt cake, smiles, and “I can’t believe we are going to Disneyland!” Stay tuned for another post about Disney! Wifegeeding, I am glad to hear your BD went so well! Keith, you are an awesome husband and dad. Where did you get your coke machine? I have been looking for one for a little while now. Great job Mr Geeding! Thanks for the fun update, wifegeeding, can’t wait to hear more about your adventure.